Data usage for decision making has progressed a lot in recent years, evolving from Descriptive to Prescriptive in nature. According to Gartner, around 75% of companies will invest in Big Data in the next 2 years to either enhance their business insight or expand their business landscape for better profits and analysis. Organizations are looking to utilize Big Data for immediate benefits like boosting customer service, streamlining decision-making processes, and driving more targeted marketing campaigns. There are three front runners in the Big Data space who are leading the pack with their innovation and market share. These are Cloudera, Hortonworks, and MapR. Other contributors in this space include IBM, Hadapt and Zattaset, but we will discuss them in a later blog in this series. While Cloudera and HortonWorks were the early arrivals and have about five to six years of head start on MapR, it is MapR that has brought us most of the innovations in this space recently. They introduced their own proprietary version of Hadoop that enhances its capabilities significantly and makes MapR the innovative player in this space. Map R-FS – MapR proprietary file system which redefines how data is written and read from Hadoop. This enhances the capabilities of traditional HDFS (Hadoop Distributed File System) that is used by other Big Data vendors. While traditional HDFS only allows to append data to file, MapR-FS can write to a file at any offset. MapR-DB runs inside of the MFS (management file system) process, which reads from and writes to disk directly. This will help in optimization of I/O operations and removes needless abstractions. Enhanced NFS – Network File System is ancillary file system that stores the data. MapR has designed its own storage mechanism that increased the performance of traditional HDFS by two-folds. In traditional HDFS saving data to a disk is a two-step process. First NFS Gateway saves all the data to a temporary directory on the local file system. Once all data is stored in the temporary directory, then in second step it writes to HDFS using tools like Flume. On the other hand, MapR does not need to store data in temporary directory. It is designed to write directly to the MapR-FS. So instead of two-step process, it performs the task in one simple step and there is no need to use any additional tools like Flume, etc. Real Time Integration – MapR introduced delivery of streaming data by using a single pipe that can access multiple data sources and deliver to multiple output formats. MapR’s Converged Data Platform is essentially a message queuing engine that can handle sources ranging from real-time Internet-of-Things streams to typical structured relational databases. It can pull data from multiple data sources and deliver information on a publish-and-subscribe basis to people and machines. For example, data can come from a combination of sensors, newsfeeds, log files and database queries and be delivered directly to user dashboards, analytics engines, report generators and batch database engines, from a single stream depending on how subscriptions are defined. RDBMS (Relational Database Management Systems) such as the Vertica MPP (Massively Parallel Processing) engine can run directly against files stored on MapR-FS. HDFS will require substantive development to perform these tasks. Transparent Compression – High-availability and failover architecture is very important for Big Data. Data is replicated periodically data clusters to achieve this. To move high volume of data between clusters, data is first compressed and then moved. Typically, MapReduce jobs are used to compress the data and prepare it for replication. MapR automatically compresses the data for every replication, so there is no need to manually compress the data. In recent years, the Big Data space has revolutionized how data can be captured and consumed. 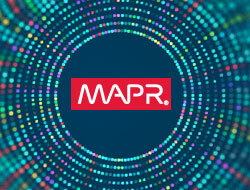 MapR is evolving the Big Data ecosystem with their innovative technology. This has resulted in some strategic investments from Qualcomm and Google Capital that will allow MapR to continue with their growth and lead the pack of Big Data vendors. For more information on our relationship with MapR, contact info@emtecinc.com or visit our partner page. Nandakumar is a Senior Software Specialist with over 15 years of experience in the IT industry. He has worked in both supply chain management and transportation sectors where he handled pre-Sales, business requirements, solution and technical architecture, planning, project delivery and management. For the last 5+ years he has helped clients and organizations build scalable enterprise applications to support business needs and map their business processes to technology investments.